In the mid-1950's a group in the Colonial Village area decided they wanted a church. We originally met in the lobby of Elmhurst Elementary School on Pattengill. We bought land and built a small church on the corner of Mt. Hope Ave. and Boston Blvd. 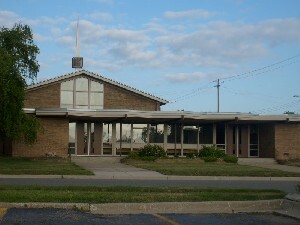 Grace Methodist Church became Grace United Methodist Church when the Methodists merged with the United Brethren churches. Our first pastor was Walter Creason. It was not long before we needed more space. We added the Fellowship Hall, kitchen, library, Chapel and narthex. Our original parsonage was on Blair St. but we got a good deal on the present parsonage later on. We added more classrooms and the choir room in the 1990's. Parking was a problem so when the car storage lots behind the church on Mt. Hope were put up for sale we bought 13 acres with two buildings. One building was sold to Colonial Village Baptist Church along with some of the lot. We sold some land for the senior apartments and Cole Academy later.